I had to put the 54's away for a bit. They were getting rowdy and suggesting all sorts of changes in the attitude of the rules, demanding to be treated as individuals, and being given 'proper' morale tests and all sorts of nonsense, not to mention numerous reinforcements. So I confined them to barracks for now and reset the table for a 2nd Oerburg War 40mm game. Long Li draws a bead on the approaching enemy. Its interesting how the reversion to a 6" grid has changed the look and feel of the game. One of the old 4 figure units now looks too small but larger ones look like they should have more dice and be able to take more hits even though the current rules take no account of how a unit is represented on table whether 4 or 12 toy soldiers or a single block of wood. I was almost tempted to give it up and go back to the smaller squares but I like how the terrain, artillery and wagons fit better and I suspect the games will look and play better with fewer but more persistent units than with more small, vulnerable ones and I'll be happier if more of the already painted figures can fit on the table for a game. The Oerburg lines with some very Oberhilse-ish looking "Volunteers". After mucking about with 6 figure units, 2x4 figure units and various other options I have (with great relief) decided to make the original 2014 8 figure units work. Infantry will have 4 stands, cavalry 3 and Artillery & MG units 2 stands. All stands get 1 or 2 (or 3 rarely) dice and can take 2 hits. I've been futzing about with details and choices and finally realized that I can't cover all the details I want in The Tin Army like detachments, limbering, formations as well as some design notes in a two-sides of a page ruleset version like I've been trying to do. I need to lay out a full set of rules with explanations plus a quick reference sheet, like I did for Hearts of Tin ten years ago. The alternative is to simplify, make consessions, simplify, but I want this to feel like a more conventional game and provide games that last 2-3 hours for an average scenario. So, confirm the basics then start writing. Good! Its the right season for it. An overview of the game in waiting. So when when shall me, myself and I meet again? to see the battle lost and won. Hard to say, maybe tomorrow, maybe not until next weekend! The Tin Army Steps Back and DIgs In. This all started with that recent fit of nostalgia for an OSW game with long lines of formed battalions of toy soldiers. Twenty 54 mm soldiers deployed 2 deep won't fit in a 6" grid but a 12 figure one will. One such battalion actually looks pretty stubby but 5 or 6 of them start to look ok.
Of course to make a decent game of that sort I need to have at least 6 battalions though more wold be better, plus cavalry, artillery etc and.....why was I doing this again? 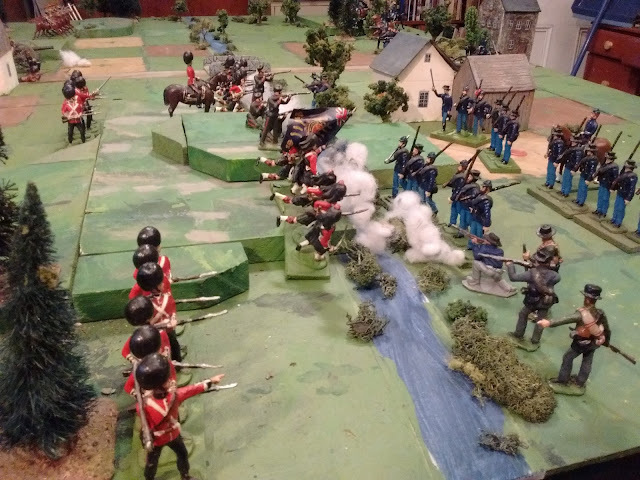 It was starting to sound like a 54mm Alt-history version of my 20mm ACW games with Divisional sized battles and nothing like the small, quick, 4 figure Square Brigadier games I have been enjoying off and on. Having revived some thoughts from 2 years ago, yet another test game begins. I decided that I was getting off track because I was getting confused about what I wanted to do. Painting up an extra hundred or so 54's to do the same thing with bigger figures wasn't it but neither was another quick card table game. 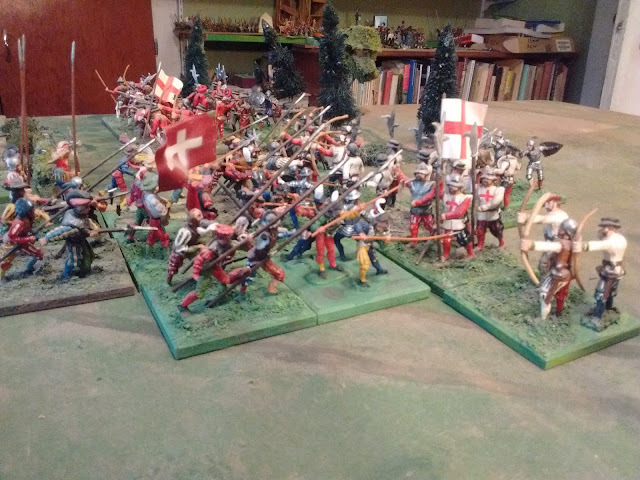 My mind went back a couple of years to the appearance of The Tin Army as an alternative for my WW1 and Colonial games on the middle sized table. Something with more of a traditional miniature wargame flavour. Since I had just regridded my once again medium size table with squares big enough to hold 2 x 60mm bases and rebased most of the table ready 54's that way, I decided to persevere with the forces in hand. This means that the "armies" will represent smallish real life forces, just right for the campaigns being considered. To avoid confusing myself the units will be referred to as "companies" though "wings" might be more accurate. If placed 2 stands wide they represent "deployed" troops ready for a firefight with a firing line and supports. If 2 stands deep they are in column for road travel or massed assaults. 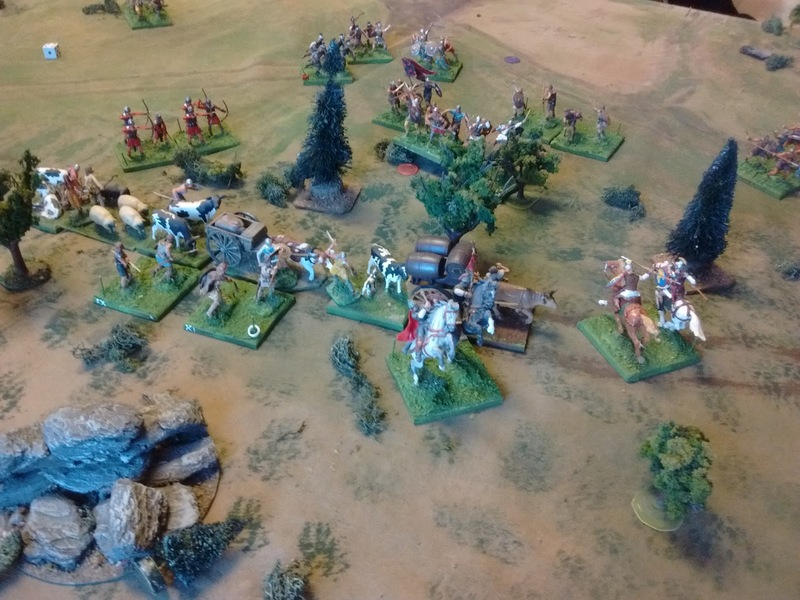 The table will easily hold 12 to 18 such units for each side, ample for a two hour game and suitable for the usual Grant teasers or games based on several appropriate small historical battles. More than that, despite the grid, the game will feel more like a traditional miniatures game than the Square Brigadier does. This is what's in my head. Its 1885 but the deployment matches the 1862 manual and is not so far off several eye witness accounts from the Mutiny. With all this in mind I broke into the rules and broke out my 1862 training manual to once again revisit recommended distances and proportions between the skirmish line, supports and main body as well as the notes about adapting to the ground and situation. It seemed to me that two lines of deployed units in combination with my existing "rear support" rule, which allows a unit to pass 1 hit per turn to a similar unit adjacent to its rear, will provide a reasonable fudge of both the look and effect of this typical deployment as used at Ridegway. The following game confirmed this. Players deployed "by the book" will find that their infantry has good staying power while an over extended player will soon find himself with holes in his line. Having repulsed the original British attack the Americans have counter attacked. The next questions revolved around play sequence and the rules for shooting and moving and the split between low intensity long range fire and intense close range fire. Superficially it seems obvious that a man doing both won't move as quickly or deliver fire as effectively as one doing just the one thing but then we get tangled in the whole quagmire of what a turn represents, and we run up against far too many instances where the moving party delivered more effective fire. There are several lengthy but inconclusive blog entries that could be written on that one topic so lets just say that there are 3 main approaches: fire OR move, fire and move with no penalty, and fire and move but with a penalty to one or both. I have used all these approaches at one time or another but recently I have been favouring allowing units to do one or the other for long range shooting but to allow units to do both without penalty and by both sides for shooting at decisive ranges (ie Combat or Melee). Back when a unit filled a grid so that units were nearly touching if adjacent it was easy to distinguish units that had to follow the combat resolution rules rather than the skirmish fire rules. Recently though, I have found that the 6" grid squares often leave a big enough gap between opposing units, especially if the terrain was interfering with where stands were placed, that I found myself making mistakes over who was adjacent and could not shoot/be shot at in the move/shoot phase but who had to resolve combat and those who were just 1 grid farther away. Given that the visuals often looked off as well, for example a "melee" between two units 8" apart with an unfordable stream between them, who were really just trading fire, I decided to revisit the whole subject. I really don't want to track anything more and nothing in my reading of accounts of battles and skirmishes indicates that it was a major issue in the 1860's so I decided to ignore the whole fire and move question for deployed units. Having decided to replace the melee rule I've been using for over a decade now I decided to go back to other OS roots and have movement, fire and charge resolution phases which was how the original Tin Army worked and what primarily differentiated it from The Square Brigadier. I was tempted to go back to the play sequence from the game in Featherstone's Battles With Model Soldiers which gave me my initiative idea but it had one issue for me. Units of the player going second always fired first even if attacking. I ended up taking inspiration from Fire & Fury which has defensive then offensive fire after each player's movement phase. An overview of the whole table. 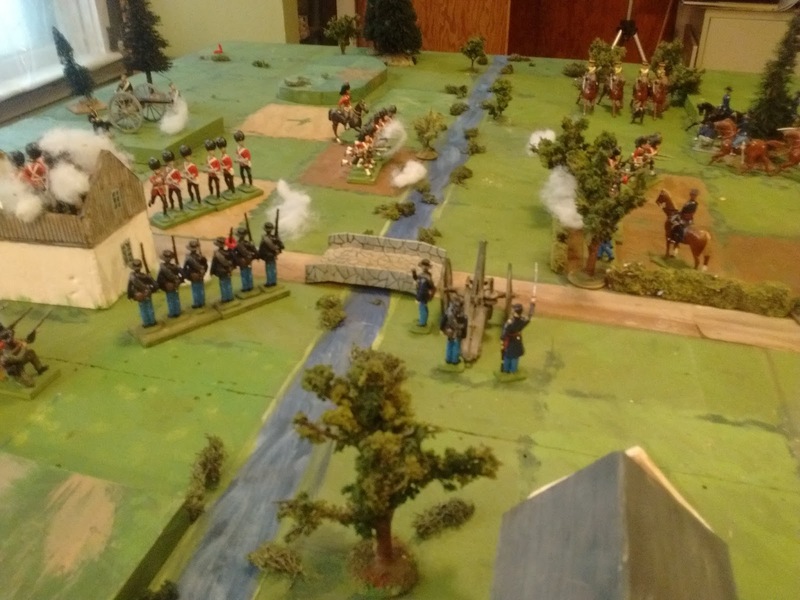 Eventually a renewed assault up the center by the British pushed the Americans back and finally broke their army morale at the very last possible moment. The result was a delightfully absorbing 19thC game and I am looking forward to more and larger ones. At the moment though the rules are back to scribbled notes and the armies still ragged and only half organized. It'll take some time to type it up in something like English and there are half painted figures on my desk. Somehow I suspect that the next game might just be a playtest of the printed version of The Portable Wargame. Assuming it makes it safely across the Atlantic that is. Here is the thing, for the Fenian Raids, or any campaigns in the Northwest, all infantry normally fought as skirmishers but for a What If 1862 Anglo American war or a traditional Toy Soldier Red vs Blue Wargame, I will need both. By the time I'd done my homework on past versions and pushed some figures around, I found that, as suspected, I had been over all the various possibilities and resolved the issue a couple of years ago. I just hadn't needed the solution for the NorthWest game or the Great War, so had forgotten it. The Final Game. In honour of Burns the British force is commanded by Colonel MacDuff and consists of 2 companies of the Scots Guards, 2 of the Black Watch a troop of Hussars and a gun. 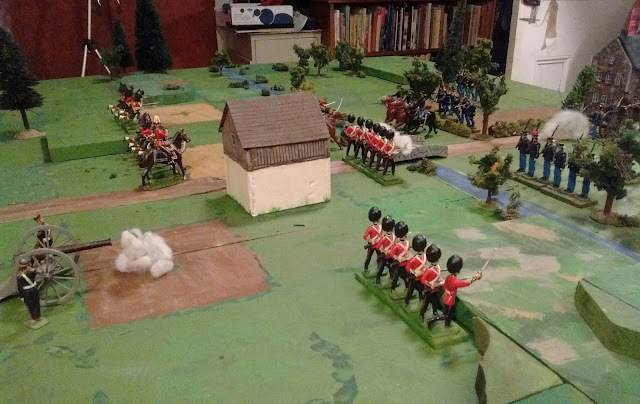 When I started to play the other day, with toy soldiers on my brain and the 6" grid before me, my mind had gone back to the old Macduff days when I could break down a battalion, detaching a company or two as skirmishers and recalling them later. I don't bother these days. For one thing, my reading has given me the impression that in battle, once half or so of a battalion had been sent out to skirmish, it could be reinforced but it was easier to call up reserves than to recall the skirmishers and reform in preparation for a close order asault. 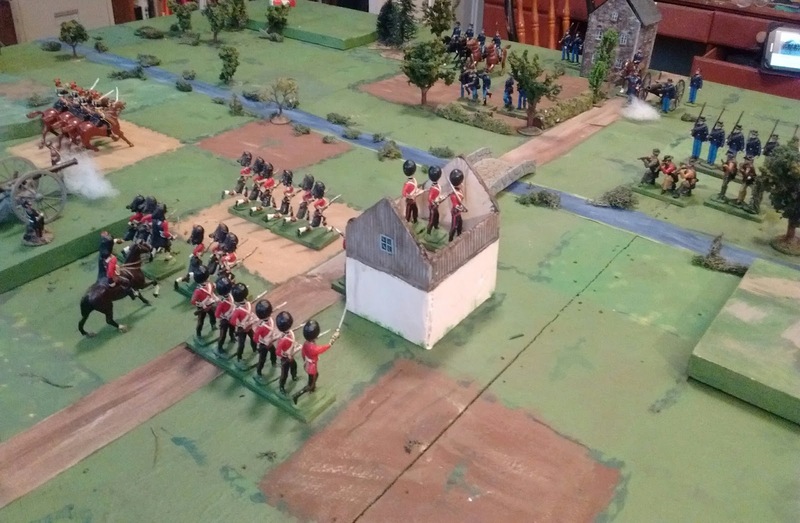 So it is that in the Square Brigadier there are small light or skirmisher units and larger infantry units. The line infantry might have a thin security screen factored in but an 1870's style deployment of a heavy skirmish line and supports is to be represented by two light units in game terms. Flank me? Flank you! 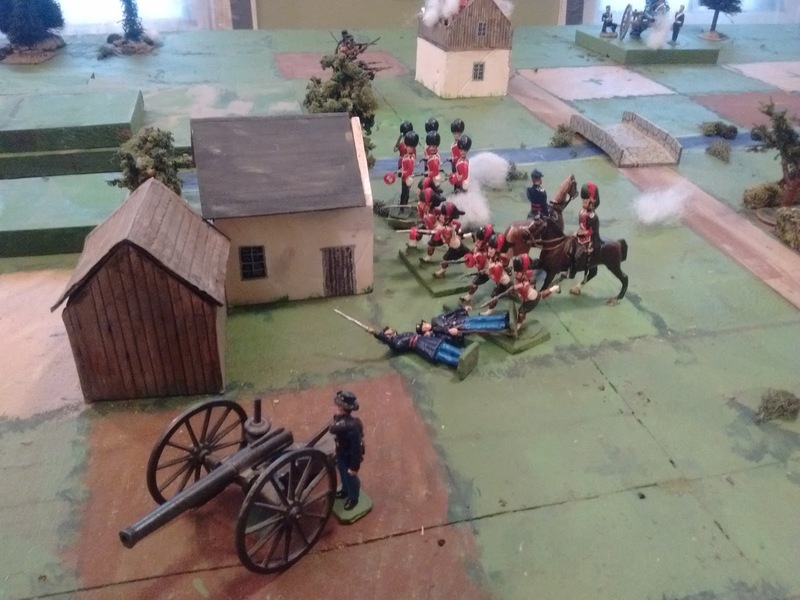 Colonel Lannigan has sent two companies supported by artillery to take the farm anchoring the British right while two more companies and a company of cavalry hold the right against four British units. The real problem was really a scarcity of American toy soldiers preventing a test game with several formed battalions. This was confounded by a surfeit of recent drafts variously labelled Square Brigadier in X or Tin Army of Y, none currently aimed at the 1860's. I rather need to tidy up the drafts and tuck the old ones into an appropriate folder. Point of Balance. As the British make headway to the North, Lannigan brings up his gun in an effort to stem the British advance. The garrison in the farm is stalwart and holds. I ended up playing the game today as originally laid down. Twice actually. One decisive American Win (Not pictured) and what was almost an equally successful British Win which turned into a last 1/2 of the 15th turn win. The End. Turn 15. American initiative. It looks like Lanigan may have pulled a draw out by having his gun block the road but a desperate bayonet charge by Highlanders with MacDuff at their head drives the gun back and captures Lanigan with the last die roll of the game. "and I Damn All Gentlemen!" I sat down to resume the game today but suddenly realized that it wasn't the 'right' game any more! 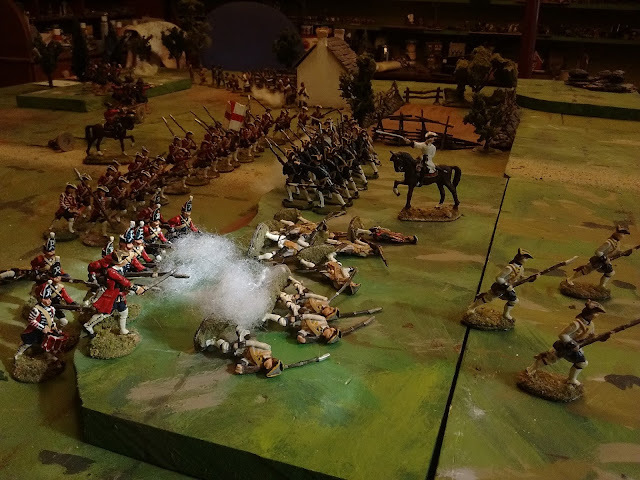 The rules I have been using for my North West games assume that all infantry are deployed as skirmishers with breechloaders but I had an itch to see formed battalions on the table as well and the urge to fallback to the 1860s and include rifled muskets was strong. This may have something to do with my interest in the ACW and Fenian Raids which was the reason for buying 54mm ACW moulds in the first place but I have a strong suspicion that at least part of my discontent today arose from having just read over 'A Gentleman's War' . Don't you hate encountering something like that then getting a nasty itch? The Advanced Guards have fallen back and the main forces are now marching on. 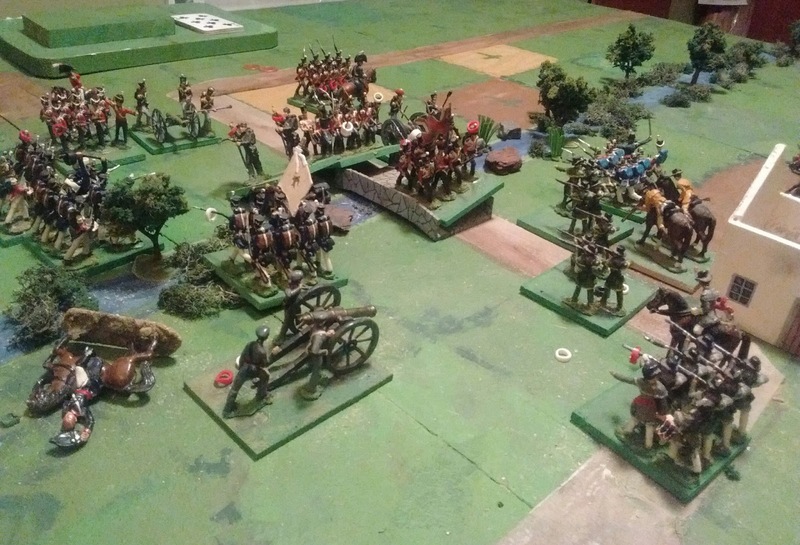 So, having reset the table with 12 figure/4 stand infantry battalions, 2 stand/4 or 6 figure skirmisher detachments and cavalry squadrons and 1 stand/4 figure artillery batteries, I've been looking over old versions of the Square Brigadier and Hearts of Tin for ideas and options for my 54mm gridded games. I'm going to need more Bluebellies! Now, where'd I put that Zouave mould? What We Need is a Diversion. Today I felt like I "needed" a game. 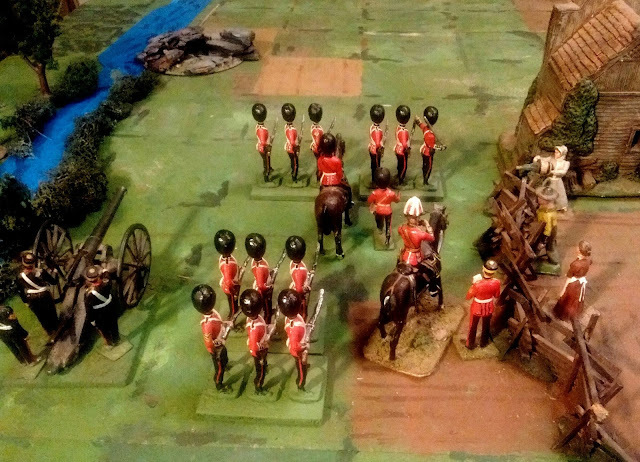 I've been reviewing a slightly revised edition of Gentleman's War, Howard Whitehouse's toy soldier rules which I had played at Fall In and thought briefly about trying them out with my 54's. I have ample Redcoats but no longer have sufficient enemy infantry (though I will ere long). I have ample 40's but wish to give them some TLC before I deploy them again. Anyway, I wanted to get my 54's out! Some variation of Square Brigadier then. Imagine! Bumping into each other at a bridge! There was already a river and a road on the board so I decided to just do an equal encounter meeting engagement with both sides seeking to control the bridge. 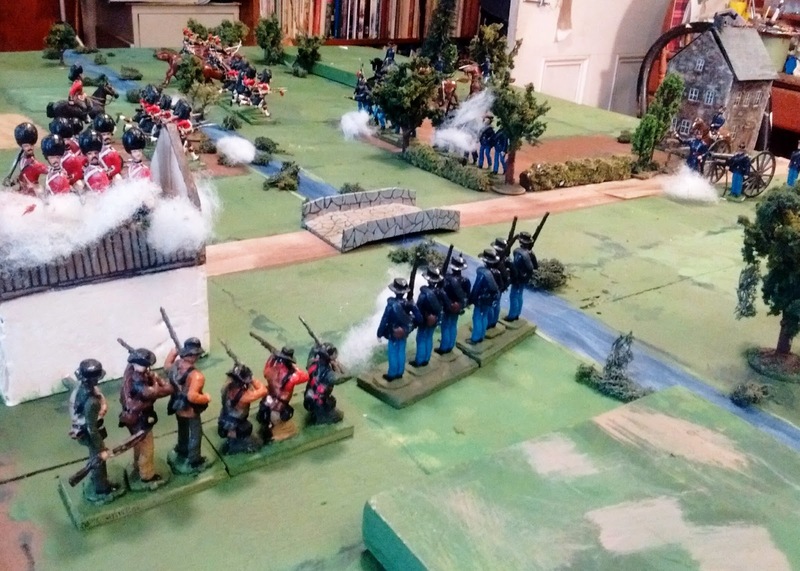 The stream is crossable by infantry and cavalry but artillery and wagons must use the bridge. The setting and background is up in the air, just another border skirmish at some lightly settled point on a long frontier. 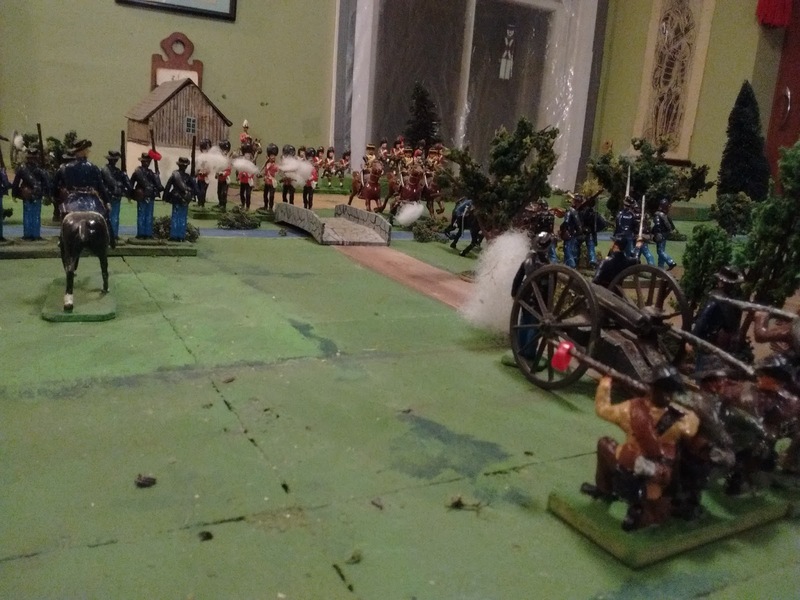 Turn three and the guns have opened fire. Of course by the time I decided what I wanted to do, set the game up, and started playing, my time was over! Ah well, toy soldiers are patient and we will resume play tomorrow. Well the day has come and gone and I enjoyed myself, hopefully the players did too. It was certainly a close game for most of the more than two hours. Even the smallest event can remind us of the potential need to react to the unforseen (ie friction). In this case I missed a passing reference to a ping-pong table in a day-before-email on start times. I was expecting something like a 5x6 playing area. Now, I could have just declared that we were only playing on 1/2 the table but I hate to surrender playing area without a struggle so I rearranged things a bit and stretched terrain out while berating myself for not extending the roads to the edge of the cloth as originally planned and for deciding not to bother bringing extra wall sections, trees etc. Aw well, one has to adapt, be flexible and make do as best as one can. Told you we'd be safe from the horse archers in these woods. Enemy Light Infantry? Where? The rules are still in development so I was especially glad to get in an actual test game with actual players before heading to Huzzah in May. Over all they worked as intended but it was soon clear that I had forgotten to actually write down a couple of little things, relying on my own habits, and that there were, as usual, some different ways of doing certain things that I hadn't considered. I need to add the accidental omissions but also need to decide how picky I want to be. Do I need to be more explicit about manouver options, tweak the rules to be clearer and simpler (one man's simple is another man's puzzle) or just not worry about it. All this quick play, gridded stuff has made me more forgiving but some contemplation is required. All of the beef, mutton and flour were captured during the last couple of turns but the Beer cart made it to the Fort which tried to declare a draw if not an outright win due to cargo value. So much for the game, time to get back to Toy Soldiers with rifles. I've had various topics to blog about this week, including a new Prince of Valdur adventure, but apart from the usual extra Winter type chores and the following recovery periods, I've been too busy. The Centurions have been busy. 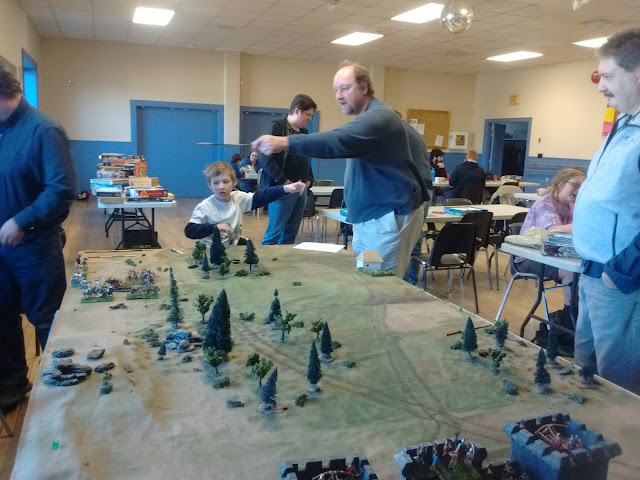 On Saturday I'll be running a Miniature Wargame at a multi-genre games day event. Not just a public venue but the first game that I've run for the guys from the valley who I've started gaming with a couple of times a year (except Jeff who I've gamed with for a decade) . It doesn't need to be spectacular but it would be good if it was fun and doesn't embarass me by being too shoddy. 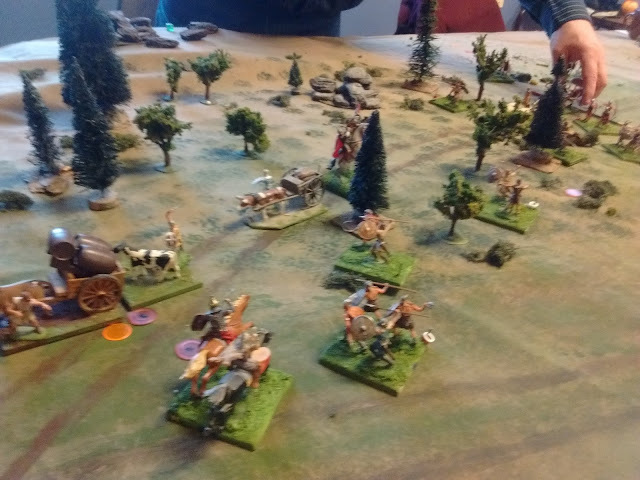 The chosen scenario is a minor variation of the venerable Wagon Train from Grant's Scenarios for Wargames, an old chestnut that rarely fails in any period. 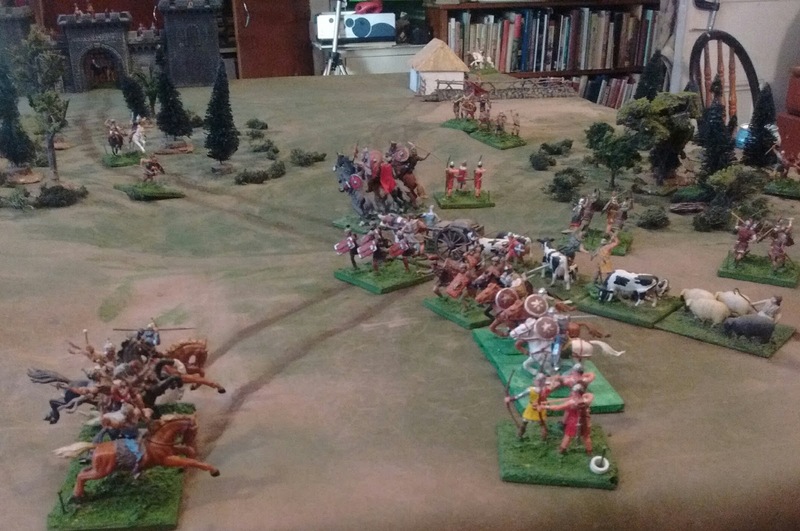 My choice of toys and rules was to make it the first public outing for both my new increased 'horde' of Elastolin Huns and Romans and my Gathering of Hosts rules. The trick was that neither were ready! Between Dithering and Distractions, the refurbishing and integration of my new and old Elastolin hosts, which I had expected to have finished last fall, hadn't really begun. Taken slowly and done with loving care, this was a project that I could have dragged out and enjoyed for a decade or more, if that was my nature, but as it turns out, using my new 'wait, wait.....GO GO GO", impetuous, slapdash approach allowed me to make a final decision on permanent unit stands vs temporary units using individuals on magnetic movement trays, and get about 40 useable units based and refurbished in a week. In other words over half of the figure pool and sufficient for the day. The armies are a hodgepodge of original, repainted, partially repainted, converted and done from kits and I love 'em all. I also managed to implement an idea I stole from Jeff ( Armchair Commander blog) a nail stuck in the base to hold my casualty rings. A new armoured Hun, converted from a knight. Note post and red ring. The basic idea and form of the rules was fairly set but some the exact details were swinging back and forth. Confirmation to a pattern vied with the attraction of strong differences and distinct characteristics for various troop types. 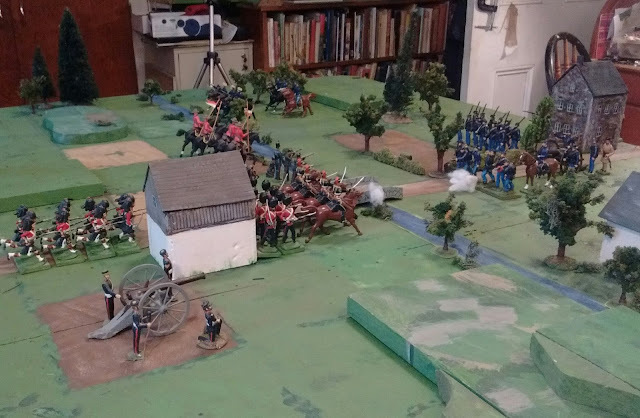 Then the whole thing nearly got ambushed and upset by an urge to go with 2 stand units on a 6" grid. A good idea on its own possibly but the associated Rough Wooing is a joint, nongridded, 1 stand is a unit, project and by covering the gridded table and playing a game I banished the deviant thought. The quickly improvised test game. Not all the troops had been refurbished yet but I enjoyed myself. Just player QR sheets to do including unit stats, combat modifiers etc and a mere handful of individuals needing a few more touch ups and I'll be ready to go. Change can be hard. New ideas, even attractive, effective ones, often clash with accepted values. A browse through past blog posts reflects this as I have shifted from the expectations and norms of decades of accepting that more of everything was best. 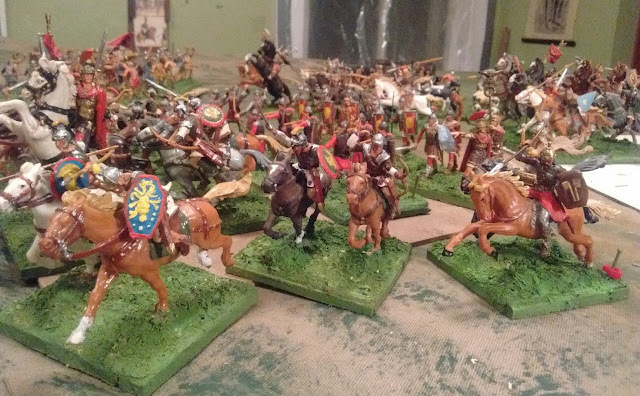 A quarter of a century ago I wanted a big table with lots of beautiful terrain and many, many beautifully painted and animated model soldiers organized into many units of at least a score of figures and games that lasted for hours. Those are all still worthwhile goals and I applaud those who seek and especially those who reach these goals. 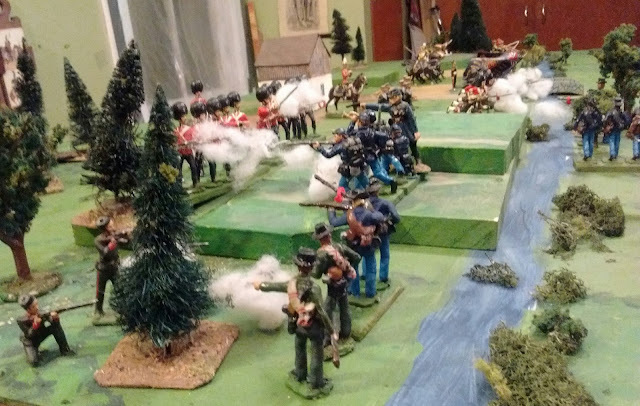 However, these days my aspirations and tastes have changed and I am most often found enjoying much smaller, simpler games with toy soldiers with an ideal game lasting two hours or so, maybe three with a challenging opponent. There are many reasons behind this change but they are perhaps less significant than the observation that after 45 years of gaming, the big, beautiful games are remembered largely as enjoyable social events while most of my favourite gaming memories are of quite small, simple games. So with this in mind, I'll turn to the matter in hand. One of the reasons for enlarging the size of my grid squares was to make it easier to accommodate 40mm figure compatible terrain features but another was to allow me to use larger units for the look of the thing. 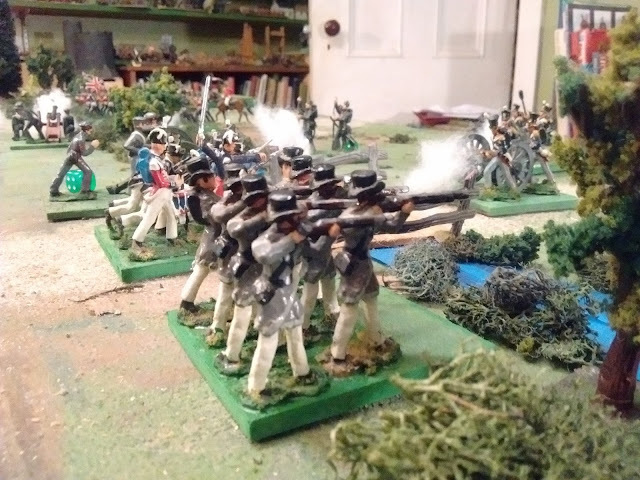 As I went to lay out my 1812 figures for that last game of 2016 it occurred to me that I only had 7 units per side and that the game made no allowance for 2 stand units, they were treated just the same as one stand units just visually more attractive. Instantly I felt an urge to add something, formations definitely, and preferably combat dice and attrition by stand as in the old Hearts of Tin. Something to make having two stands different and better than one. I also felt apprehension that the game would be too short if I didn't make changes. Lacking time to properly think out and test some rule changes I considered using the same number of stands but treating each as a unit and treating each 3"x3" quadrant as a square, something I have done before to make the table "larger" and to double the size of the armies. Again though this would be an impromptu change which might or might not work. It would at the least almost certainly make for a longer game but by the time we sat down the day was passing rapidly, and I opted to go with what I was confident of, which is to say the standard Square Brigadier with one square = one unit regardless of how it is represented and I enjoyed the resulting game with seven units per side even if it did only last an hour . The next day however, I reset the table to try the one stand is a unit on a 3" grid version with no rule changes. The one stand is a unit in a 3" square version.. The result was a two hour game with fourteen units per side which was OK but which looked more like the dog's breakfast than battle lines. It lacked the tension and excitement of the first game since the loss of any one unit was not significant given the ample reserves. What did change was that the terrain shrank. For example, the riflemen in the farm had no significant reach and their stronghold was now easily bypassed making it irrelevant. This was not necessarily good or bad, just different but it would have to be considered when designing scenarios. 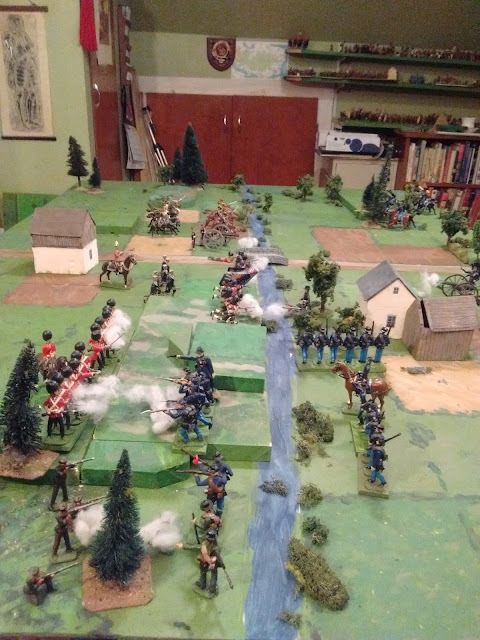 More importantly is that the rules were still treating each unit as a small battalion but they didn't look like it and what was supposed to be not much more than a skirmish between brigades became bigger than most War of 1812 battles. That wasn't the intent. My conclusion was that the one stand per grid on a 3" grid would only work for me for me if I changed the scale, doubling ranges and so on. To get the right sort of look I would need to go back and try again to add an effective group rule with group sub-commanders and rules to encourage battle lines and so on. I would also have to revisit ways to make very small but practical and effective terrain for 40mm figures. But would it be worth it? Probably not, I've tried that path before and failed, more than once. In any case, I rather like the look of the two stand units on the 6" grid. Some rules for columns and lines would not be amiss though. I have considered allowing the two stand units to roll more dice and take more hits but the main effect apart from lengthening the game appears to be shifting the game towards average results resulting in slow, indecisive, less exciting victory by attrition. The Dec 30th game with each unit occupying a 6" square. I turned my mind from rules to the best use of existing figures for Atlantica as well as the War of 1812 and a look at what would be easily possible. The various line infantry units were largely raised as 18 or 24 figure battalions. I have managed to squeeze 8 figures onto temporary 60mm x 60mm stands but not only do many look a little crowded for toy soldiers but its not a great match for the existing units. 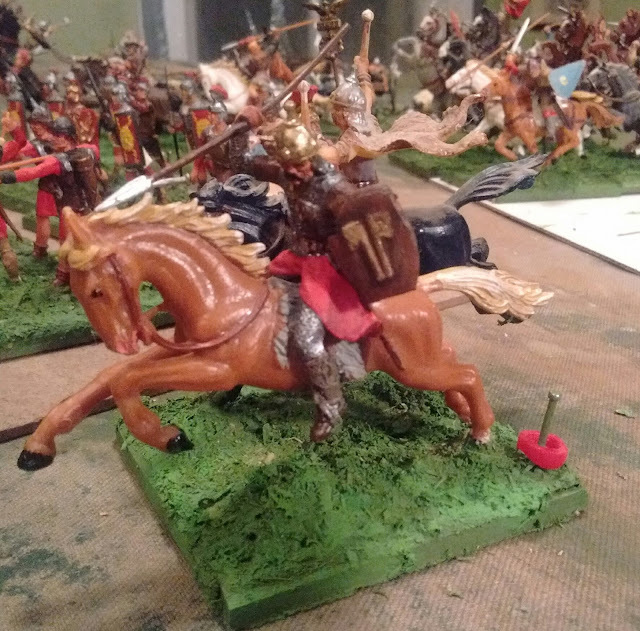 Most of my other horse and musket/rifle armies are moving towards 3 figures on a 60mm width and this seems like a good choice here giving me 12 figure line battalions, 6 light infantry or cavalry. This looks pretty small now but my early 15mm armies were organized in 12 man battalions for the WRG 1685 to 1845 rules so its not new. With the addition of a few more flags and drummers, maybe a few more privates here and there, I will easily be able to field a dozen units per side, all arms included. Enough to fill the table and remove the need to make units more resilient. The estimated length of a game will again be able to be gauged by the size and complexity of scenario chosen without any need for rules to give each unit greater longevity. My existing terrain will fit as planned on the 6" grid and I will still be able to use the same armies on the portable board by using only one stand per unit without anything changing but the look of the thing. The last 10 years have seen wave after wave of changes and challenges in my life, something inevitably reflected in the turbulent state of my hobby. It feels a little strange then to look back on 2016 as a year of little change in my life, a year which has seen various lengthy internal hobby debates finally reach conclusions which feel natural and tested rather than arbitrary or dogmatic. Could this be the year when my plans relate meaningfully to what I actually do? Maybe, where's Lucy with the football? 1. Gathering of Hosts. 40mm "Shock Era". This is technically my oldest active wargaming collection since it incorporates a few figures that I first played with when I was 5 (an I ain't talkin' replicas). Part of it is essentially duplicated in 25mm including my first 25mm wargame figures but when I was fortunate enough to be offered a collection of Elastolins that would double what I had, I decided to archive the 25's and base and organize all of the 40's into one compatible unit pool for three overlapping settings: a Prince Valiant inspired Fall of Rome setting, an historical 16thC setting and a medieval-fantasy setting which will incorporate some of the barbarian types and Huns from Prince Valiant, some of the late medieval knights, archers and pikemen from the 16thC and various other medieval and fantasy elements. Look for a series of early Medieval (5thC) games this winter followed by 16thC ones leading up to a proposed appearance at Huzzah and then, hopefully, a medieval/fantasy campaign over the summer and fall. 2. Not Quite the Seven Years War in America. (NQSYWA). 40mm Semi-flat. This is a sort of extension to the existing Charge! & Prince August Semiflats collection. Making two incompatible collections of Seven Years War semi-flat figures just didn't make sense so I will use the new moulds to paint up some new Charge! compatible units on magnetic movement trays. There might or might not be some small games later this year but the focus this year will be on painting more French troops and then my first British units once those moulds are released. 3. 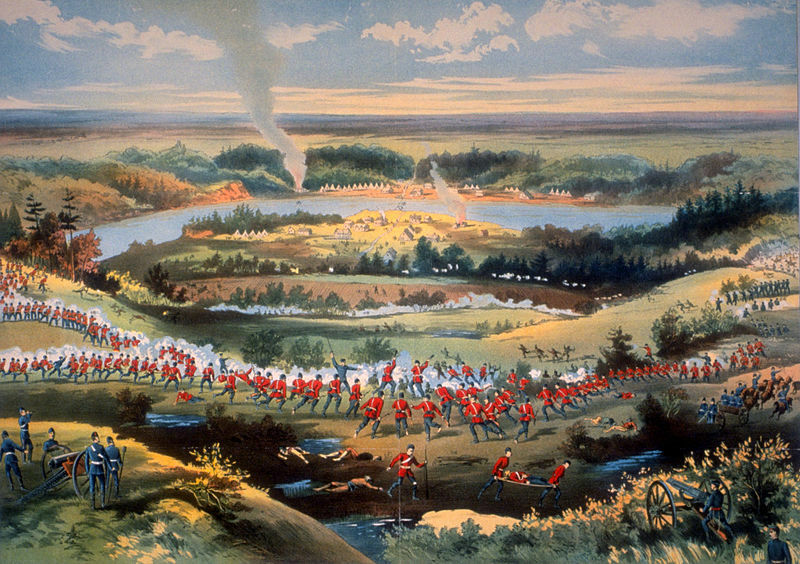 War of 1812-1842. 40mm Square Brigadier. This is a catch all for historical and non-historical early 19thC figures. The goal for this year is to field two opposing War of 1812 armies, all flocked etc and organized as 2 stand for the 6" grid (1 stand units if using the portable board). This may then expand later to revive the earlier Atlantican colonial campaigns. 4. ACW. 1/72 mostly Airfix. My existing 1/72nd mostly Airfix collection will continue to see some service this year but first there is terrain awaiting paint and a decision to be made on the level of game to be played and a bespoke ACW version of which ever of my existing rules that I decide to use. The plan is to get some fences etc done before the next game but sometimes these guys seem to just pop out of the box and on to the table when they feel like it. 5. North West Campaign 54mm Toy Soldiers. This is the last home of my 54mm toy soldiers, a mix of vintage Britain's and homecast figures plus a few strays. I'm not sure exactly where its going but I'm sure it will continue to grow and see action on the table. 6. The Great Atlantican War Shiny 40 mm toy soldiers. 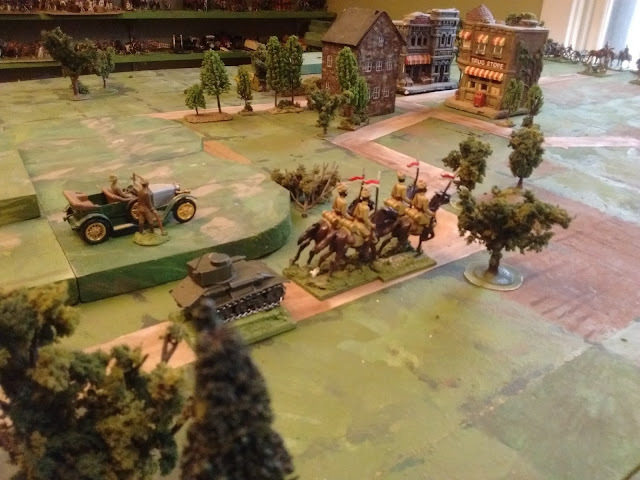 This is the great early 20th Century war waged by toy soldiers in my fictional land of Atlantica. I want to get this on the table more often and maybe even manage some mini-campaigns but first I need to do some work on organization and presentation. This probably won't get far until after Huzzah in May but I'll be very disappointed if I don't get my act together on this in 2017.